The first known surviving giant panda triplets were born at the Chimelong Safari Park in China's Guangdong province on July 29, 2014. 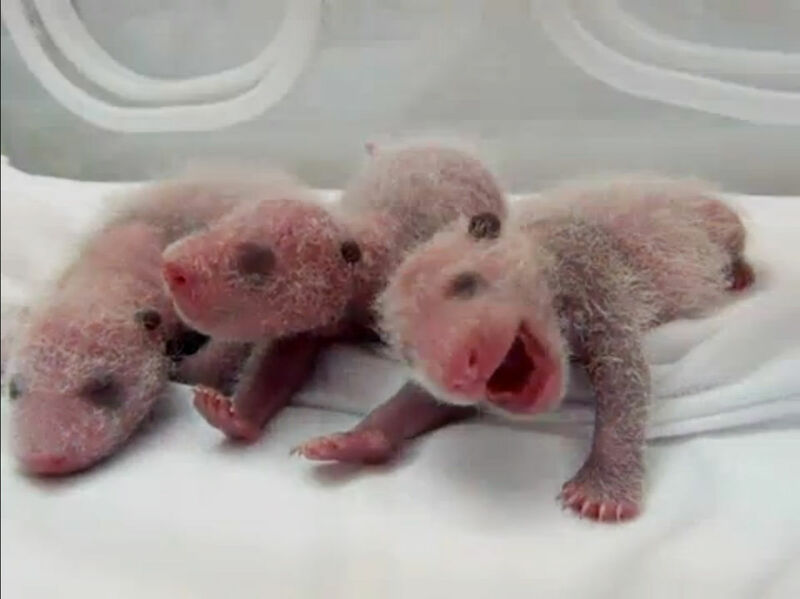 A zoo in southern China celebrated the birth of the world's first known surviving panda triplets, a rare event for the endangered, bamboo-loving bears. The mother, Juxiao, gave birth to the trio on July 29, but the Chimelong Safari Park only announced what they called the "miracle" birth on Wednesday (Aug. 13), for fear the triplets might not make it. Panda cubs have an "extremely high" mortality rate, the zoo said in a statement. "In the wild, it is rare for a panda mother to be able to raise more than one infant, and so multiple births result in mortality of the additional youngsters," Simmons told Live Science in an email. "This occurs because baby pandas are very small and undeveloped and need constant attention. It is difficult for the mother to be able to provide this care for more than one [cub]." Following Chinese tradition, zoos typically wait 100 days to name baby pandas. That way, people won't get too attached to the tiny, blind creatures whose survival depends on their mothers. The zoo also plans to wait before announcing the cubs' genders. The mother of the triplets was so exhausted following the birth that zoo workers placed the cubs in incubators, allowing Juxiao to rest. The three bears are now nursing with their mother, zoo officials said. Photos of the incubator show the tiny cubs with wisps of white fur covering their pinkish bodies. Across the world, the Royal Zoological Society of Scotland also had good news to share with the panda community this week. After an artificial insemination, a female panda named Tian Tian appears to be pregnant and may give birth by the end of the month. "This is all very new and complex science, and we still have a bit of time to go yet, as like last year, the late loss of a cub remains entirely possible," Iain Valentine, director of giant pandas for the Royal Zoological Society of Scotland, said in a statement. A team of experts inseminated Tian Tian on April 13, during the season when pandas typically mate. Those experts will continue to follow the pregnancy by studying the hormone and protein levels present in her urine. But they won't be sure whether Tian Tian is, in fact, pregnant, until she gives birth. "Monitoring a female giant panda's behavior — for example if she is sleeping a lot, eating more or spending time in her cubbing den — is not an indicator of if she is pregnant or otherwise, as giant pandas experience pseudo pregnancies," Valentine said. In the case of such a pseudo pregnancy, "she will show 'pregnant' type behavior whether she is pregnant or not," he said. In 2013, experts operated on Tian Tian, performing the first successful artificial insemination of a giant panda in the United Kingdom. However, Tian Tian lost the fetus late in her pregnancy, the zoo said. Panda aficionados can catch Tian Tian on a Panda Cam at the Edinburgh Zoo. About 1,600 wild pandas live in the mountains of southwestern China. But the endangered species, which has a low reproductive rate, also faces habitat destruction. Follow Laura Geggel on Twitter @LauraGeggel and Google+. Follow Live Science @livescience, Facebook &amp; Google+. Original article on Live Science.